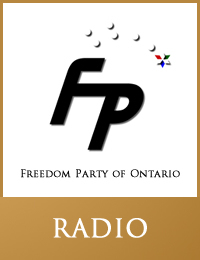 On The Live Drive with Andy Oudman (NewsTalk 1290AM CJBK, London, Ontario) Paul McKeever, leader, Freedom Party of Ontario, discussed his opposition to the Ontario government’s January 12, 2015 announcement that it would grant $50M to Guelph auto and wind-turbine parts manufacturer Linamar. Freedom Party had issued a media release about same shortly before. Oudman also asked McKeever what he thought about Ontario PC leadership candidate Monte McNaughton’s January 12, 2015 announcement that he would pull the plug on wind turbine contracts in Ontario. McKeever replies that he thought it was a good idea when Freedom Party first proposed it during the 2014 election, and that he was happy to see McNaughton steal the idea. NOTE: The recording of this conversation started one to three minutes after the on-air radio interview began. “Freedom Party leader Paul McKeever has objected to the Wynne government’s announcement today that Ontario will give $50M to Guelph auto parts manufacturer Linamar Corp.
“One proper function of the Ontario government is to ensure that nobody is looted by his neighbour”, said McKeever. “The Wynne government instead is offering to do the looting for one of our neighbours”…” Click here to read the full media release.